From solar-panel cleaners to housing-insulation specialists and wind-turbine climbers, Germany's move to a low-carbon economy powered by renewable energy sources is shaping new businesses and the jobs market. In this dossier, we look at the effects of the Energiewende on business models and employment in Germany's services, trade and manufacturing sectors. Who will be big players in the new energy world? Germany’s Energiewende, or renewable energy transition, is dramatically transforming Germany’s economy. On this point just about everyone in Germany concurs. New jobs and business models have emerged, well beyond the renewables industry. And analysts see potential in services, research and high-tech. But the conventional energy sector has been bleeding jobs. Business leaders worry that the costs of the nuclear phase-out and the move into renewables could hurt manufacturers such as machinery makers, the car industry or other traditional pillars of Germany’s economic success. Statisticians and researchers are having trouble keeping track of the rapid changes, making a full assessment difficult. And the collapse of the solar industry in recent years has shown how fast fortunes can turn on the way to a completely different energy system. The jury is still out on whether the Energiewende headed for an ultimate economic success as many upcoming political decisions such as a new power market design will have fresh impact. A broad range of experts, green businesses and lobbies, much of the public and most of Germany’s political class, however, see the transition as a modernising catalyst that benefits German businesses up-and-down the value chain. Chancellor Angela Merkel and her cabinet regularly underscore the job and revenue-creating impact of the Energiewende, as well as its export potential. The Borderstep Institute and the University of Oldenburg estimate that 81 percent of new “green economy“ start-ups between 2006 and 2013 were in renewable energy, energy efficiency, and climate protection. Their research shows that 170,000 start-ups in the “green economy” were founded between 2006 and 2013, with young green businesses providing 1.1 million jobs (Also see Factsheet Where the Energiewende creates jobs). Of the roughly two million jobs the German Federal Environment Agency (UBA) estimates belong to environmentally related fields at least half are tied to the Energiewende, the study’s author said. According to a study commissioned by the Federal Ministry of Industry and Energy, about 371,400 jobs (2013) stem from renewable energy production and supply, manufacturing power generation hardware, related R&D, and servicing renewables generation facilities. The German Industry Initiative for Energy Efficiency (DENEFF) calculates 848,000 jobs (2013) from the energy efficiency push. These figures omit other sectors also impacted by the Energiewende, including higher education and training programmes; think tanks and consulting firms; emissions-reduction technology; the decommissioning of nuclear reactors; IT and smart technology; power grids (for the growing renewable energy supply); sustainable mobility; green investment services (like GSL Bank, Ökobank, and the Umweltbank); as well as power storage, architecture, tourism and more. No official or unofficial figure exists for all Energiewende-created jobs, exports or revenue. “In some sectors there’s a direct impact, like on e-mobility, storage and grid technologies. And then there’s an indirect impact on many others caused by energy prices or climate protection measures,” argues Krischan Ostenrath of the Science Shop Bonn, an NGO focusing on economy and sustainability. Businesses benefit (or suffer) from the Energiewende to different degrees, making it hard to calculate the full economic impact, he says. The two-million figure is out-dated (2010) and incomplete, he says, asserting the actual figure today is much higher. Economists such as Ulrike Lehr and Philip Ulrich of the Institute for Economic Structures Research (GWS), who work extensively on the topic, say: “The economy will be better off with the Energiewende." By 2020, they calculate, the renewable energy industry could contribute as much as 37 billion euros annually to GDP and the total number of jobs will be 120,000 higher than would be the case in the absence of the Energiewende. According to the Institute for Employment Research (IAB), the research arm of the Federal Employment Agency, these jobs tend to demand higher qualifications than those in the conventional energy sector and are 10-14 percent better paid. Many Energiewende-related businesses owe their existence to public policies, Lehr says. "Whether the Energiewende creates growth and jobs in Germany in the future depends on how seriously it is taken by policymakers and the private sector. The Energiewende is not a panacea for economic growth and jobs,” says Lehr. If policy doesn’t actively back renewable energy expansion and energy efficiency, much of the investment to date will be squandered, she argues. But if supported, she says, "growth and employment will benefit in the long term." Her analysis of the Energiewende’s economic effects – with high and low models – takes different degrees of policy support into consideration. Carola Kantz of the German Engineering Association (VDMA), representing 3,000 machinery companies, is of similar opinion. VDMA’s largely medium-sized businesses, she says, such as makers of power plant components, cables, batteries, transformers, compressors, and a wide range of construction equipment, “have benefitted considerably” from demand for renewable energy and efficiency-related hardware and technology, much of which they export. She notes that most of the VDMA’s members are not exempt from the renewable energy-support fees, as are larger, energy-intensive firms in Germany. But Kantz complains that the “zigzag course” of German governments in recent years is a problem. “Our members need to know that there’ll be consistent policies and a steady energy supply in the future, 5 to 10 years down the road. This will create a stable investment climate today,” she says. The current centre-left government also sees this as critical to business and job creation in Germany. 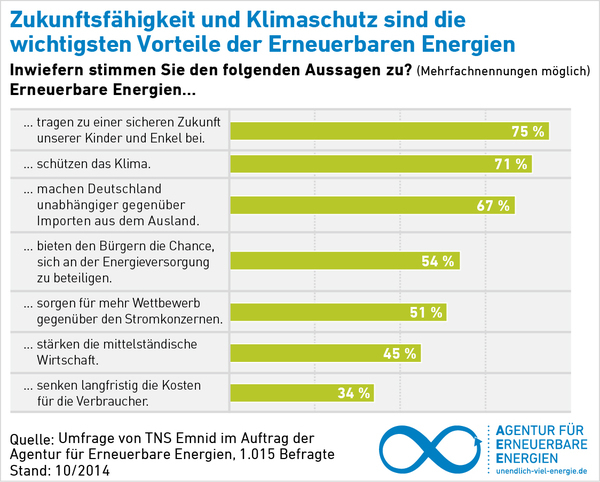 It passed measures in 2014 intended to make the Energiewende more predictable and supply more stable. Businesses, for example, can count on policy measures that aim for 40 to 45 percent renewables in the power supply by 2025 and 55 to 60 percent by 2035. In terms of capacity, solar energy should increase annually by 2.5 gigawatts (gross), onshore wind energy by 2.5 gigawatts (net), and biomass by approximately 100 megawatts (gross). Offshore wind energy installation is planned to hit 6.5 gigawatts by 2020 and 15 gigawatts by 2030. Moreover, the 2013-elected government has made efficiency a priority. It upped financing to retrofit buildings to two billion euros a year as of 2016 (from €1.8 billion now). The government will also introduce competitive tenders for a range of energy efficiency projects and it plans to design new tax incentives for energy-saving renovations. Germany wants to reduce primary energy consumption by 20 percent by 2020 (compared with 2008) and halve it by 2050. The bulk of jobs in the renewables industry stem from wind power (119,000 onshore; 18,800 offshore), followed by bio-energy (126,400) and photovoltaics (68,500), government data show. These segments also constitute the lion’s share of 2013 investment (€16.09 billion) in renewables facilities and revenue (€22.70 billion) from manufacturing installations and components. Geothermal, thermal solar, and hydro is much smaller (Also see Factsheet The Energiewende’s impact on jobs and businesses). Exports are also a big driver of jobs and business. The Renewable Energies Agency (AEE) says exports account for 44 percent of the jobs in the renewable facilities manufacturing sector. In 2014, the biogas technology manufacturing industry, which was hard hit domestically by critical reports and incentive cuts, exported 68 percent of its product. The solar photovoltaic (PV) sector, which also flagged in Germany, tripled its exports to Asia in 2013, doing 81 percent of its business abroad. Germany’s wind turbine industry, located on the North Sea and Baltic coasts, sells 67 percent of its technology to global markets. The breadth of the renewables segment is vast. It includes businesses along the entire value chain from, for example, the planting of energy crops to their sale on the retail market. Wind power jobs include employment in pre-production stages like steel and mechanical engineering, design, tax consultancy, and management; a second stage that includes making foundations, rotors and towers, and providing transportation and administration; and finally, construction and installation. In the 317,400 jobs in the renewables field, 8,300 positions in research and in public administration are also included. Energy efficiency has also spawned jobs. According to DENEFF, 848,000 persons were employed in the sector 2013, which had a turnover of 162 billion euros. “Energy efficiency is often underestimated in terms of job creation,” explains Christian Noll of DENEFF, whose calculation is based on industry surveys and other data. “Installation is extremely labour-intensive, so carpenters and craftsmen are needed for every building that’s retrofitted,” he says. Carola Kantz of VDMA says every old appliance – from coffee machines to automobiles – replaced by a new, energy efficient model is business attributable to the Energiewende. The efficiency branch is driven by regulatory (EU and German policy), socio-economic (environmental consciousness, energy prices) and technical (new production modes and technologies) factors. The 2012 EU Energy Efficiency Directive will “directly lead to significant economic growth and employment,” says Noll. Germany is in the process of writing this into law. Despite government targets and long-term fixed incentives, the Energiewende economy is fluid and extremely dynamic – highly susceptible to external shocks, policy shifts, technological innovation, and the evolving character of the Energiewende. The solar sector, for example was the wunderkind of German renewables – its turnover tripling between 2007 (€4.4 billion) and 2011 (€13.3 billion) – as Germany led the world in installed solar capacity. Many of its globally known companies, like SolarWorld, SMA, Q-Cells and others, were based in eastern Germany where the boom lent a helping hand to the region’s beleaguered, post-unification economy. But the industry laid off tens of thousands of workers and shut factory doors when feed-in incentives were slashed and cheap Chinese modules flooded the global market. In 2012, the sector employed around 100,000 people, but by November 2013 it had shrivelled to 60,000. The offshore wind industry, on the other hand, hit rock bottom when the solar industry was thriving. Technical glitches, financing issues, bureaucratic and environmental obstacles, and uncertainty about policy support left it with a meagre 100 megawatts of power capacity in 2011. But just last year, the offshore industry turned the corner, surpassing the one gigawatt mark in generation with 258 turbines in the Baltic and North Seas (142 of which went online in 2014). “It took longer than we ever thought but offshore wind finally figured it out,” says Sebastian Sahm of the Stiftung Offshore Wind Energy, a group representing the industry. “Offshore was also one of the winners of the revamped EEG [the 2014 revised Renewable Energy Act which stipulates incentives for production]. This has breathed new confidence into the market,” he says. Right after the law was revised, for example, Swedish utility Vattenfall and the German power supplier Stadtwerke München said they would move forward with the Sandbank park in the North Sea – an investment of 1.2 billion euros. The park’s 72 Siemens turbines will provide 288 megawatts of capacity. Wind industry insiders predict offshore capacity will triple in 2015 and revenue could exceed ten billion euros this year. Ulrike Lehr of GWS estimates 500,000 to 600,000 jobs in the renewables industry by 2020, most new jobs from the onshore wind sector, and maybe another 250,000 in the efficiency sector. On the other hand, Uwe Leprich, Scientific Director of the Institute for Future Energy Systems (IZES) based in Saarbrücken, believes it will be a long time before the renewable energy market reaches its 2012 peak when it added 7.5 gigawatts of capacity thanks to solar PV’s dramatic expansion. Not everybody is as bullish about the Energiewende economy as its beneficiaries and supporters. While the business community largely backs the idea, many have been highly critical of how it has been implemented. The conventional energy sector, for example, has been rocked by the nuclear power phase-out, the rapid ascent of renewables, the fall in wholesale electricity prices, the decline in energy demand, disastrous investments, and most recently, plummeting global petroleum prices. The conventional energy sector currently has 215,000 jobs (see Figure 1), down from 564,000 in 1991. Germany’s biggest utilities – once called the “Big Four” because of their dominance in supply and distribution – have suffered severe declines in revenue, jobs, and investment (see Clean Energy Wire Dossier “German Utilities and the Energiewende”). A DIHK report, titled “More Losers, Fewer Winners,” asserts that “industry and trade see themselves as the losers.” In a survey of 2,193 companies, 34 percent said the Energiewende had an adverse impact on their firms, including negatively affecting their competitive edge in foreign markets, while 14 percent saw its impact as positive. The high price of energy and stability of supply were seen as culprits. At the same time, members of the machinery association VDMA, most of them moderately sized companies, didn’t suffer as a result of the higher energy prices, Carola Kantz says. Roughly 43,000 German firms, many of them considered “Mittelstand”companies, a backbone of the German economy, are not exempt from a surcharge added to the power price to pay for renewables incentives. However, the big electricity users, such as aluminium smelters, making up for around one sixth of German power consumption are exempt, therefore paying one of the lowest prices in Europe on the wholesale market. Sebastian Bolay of the DIHK admits that German industry is highly competitive abroad. But the 2014 EEG revoked the exempt status of some German firms, like in the metallurgy sector, who now say they’re disadvantaged on the European market. “German companies aren’t leaving the country en mass,” says Bolay, “but it’s a creeping, long-term process”. Renewable energy has driven down the price of wholesale power in Germany, he says, but it’s still not as cheap as it is in Texas. Both Germany’s renewables sector and conventional energy are striving to adapt as the Energiewende reconfigures the country’s power supply and markets. Business models are changing too, including those of the over 1,000 utilities in Germany – from giants like E.ON and RWE to the many smaller Stadtwerke, or municipal utilities, scattered across Germany. “The new businesses and jobs of the Energiewende will be created through the networking of decentralized options,” explains Uwe Leprich of IZES. They “will have to fit small networks on a local level where wind, PV, cogeneration, demand management and small storage units are linked through IT and communications technology,” he says. This has already started in services that balance demand and supply to ensure the security and quality of electricity. “The drivers now and in the near future are security of supply. In the old system it was solely the central grid operators, the TSOs [transmission system operators], that handled this. In the near future DSOs [distribution system operators] have to contribute as well,” Leprich says, referring to local network companies who distribute energy across a decentralized smart grid. As ever-more weather-reliant renewables supply power, the next generation of successful energy suppliers will have to work closely with these options, he says, adding that flexibility will be a hallmark of the new system. Tobias Federico of the consulting firm Energy Brainpool agrees that the energy-sector business models of the future are up in the air. “The utilities won’t be the big players,” he says, adding that he doesn’t see any current market actors properly outfitted for Germany’s emerging decentralized, high-tech energy market. Federico says flexibility will come from both supply and demand sides. These players will have to evaluate the flexibility of various consumers. “This means collecting enormous amounts of data about decentralized production and consumption, and then understanding it. Germany’s energy companies will have to deal effectively with the power market, the grid, and the consumer market as one entity,” he says. The trajectory of two of Germany’s energy heavyweights – the solar PV firm SolarWorld and the nation’s biggest utility, E.ON – illustrate the path Germany’s energy market players are trying to forge. SolarWorld made the leap to a new model after the bottom fell out of the solar PV market in 2011. It recast itself from manufacturer of solar cells, silicon wafers and PV modules to on-the-ground “energy management” provider, offering services and state-of-the-art technology at the interface of supply and demand markets. This includes energy consulting, installation and design, demand and consumption management, automated energy management, and combined rooftop PV and storage options. Not everybody is convinced that the solar industry will make it with this new model. Bernd Hirschl of the Institute for Ecological Economy Research (IÖW) says the PV sector was hit very hard by abrupt changes to state incentives in 2011-2014. Now, new measures include a surcharge on the power use of self-consumers – exactly the market segment that SolarWorld and others hope to capture with their energy system packages. E.ON is a different story, one of the Big Four that shared in a lucrative, closed oligopoly in energy supply and distribution. But market liberalisation, the unbundling of supply and distribution channels, the entry of renewables and its failure to invest in them, some poor investment, the decline in wholesale power prices, topped off by Germany’s shutdown of a third of its nuclear fleet (two of the biggest plants belonging to E.ON) were tough on E.ON. Early in 2015, the group reported a record loss. It already announced a tough cost cutting programme including lay-offs in 2011. Last year, E.ON said it would separate its conventional fossil fuel and nuclear assets into one firm, creating a new company for renewables, networks and customer solutions. The latter will focus on innovation, offshore and onshore wind power in Europe, and to a lesser extent, solar power. It will also upgrade its energy distribution networks in Europe and Turkey making them “smarter,” to offer products and services in energy efficiency and distributed generation.